According to the EPA, Americans, on average, spend approximately 90 percent of their time indoors, where the concentrations of some pollutants are often 2 to 5 times higher than typical outdoor concentrations. Most pollutants affecting indoor air quality come from sources inside buildings, although some originate outdoors. Typical pollutants of concern include combustion products such as carbon monoxide, particulate matter, and environmental tobacco smoke; substances of natural origin such as radon; biological agents such as molds; pesticides; lead; asbestos; ozone (from some air cleaners); and various volatile organic compounds from a variety of products and materials. This is even more striking when the health eﬀects attributed to outdoor ﬁne particulate matter (PM2.5) rank among the risk factors with the highest health impacts in the world, annually accounting for over 3.2 million premature deaths. In October 2013, the World Health Organization announced they are considering particulate matter, a major component of indoor and outdoor air pollution, as a Group 1 carcinogen along with tobacco smoke and asbestos. Public Lab has initiated a Particle Sensing Project focused primarily on Silica. This project overlaps with and includes the DustDuino and is coordinated on the Air-Quality Google Group. Section 109 of the Clean Air Act directs the Environmental Protection Agency (EPA) to establish National Ambient Air Quality Standards (NAAQS) requisite to protect public health with an adequate margin of safety (primary standard) and for the protection of public welfare (secondary standard). Section 109(d)(1) of the CAA requires EPA to complete a thorough review of the NAAQS at 5-year intervals and promulgate new standards when appropriate. EPA and its State and Tribal partners publish near real-time air quality data (typically hourly updates) as well air quality forecasts on the AirNow web site. 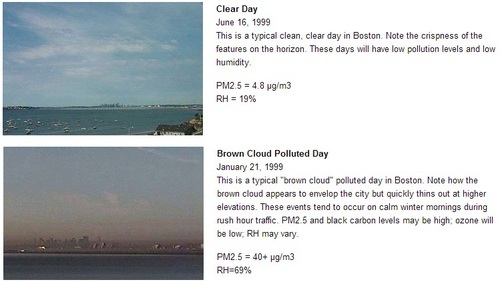 The AirNow site also contains, links to Visibility Cameras, which are yet another way to evaluate air pollution. The U.S. Center for Disease Control (CDC) and its National Institute for Occupational Safety and Health (NIOSH) also offer a wealth of guidance. In particular, the NIOSH Manual of Analytical Methods is a collection of procedures for sampling and analysis of contaminants including workplace air. The Agency for Toxic Substances and Disease Registry (ATSDR), based in Atlanta, Georgia, is a federal public health agency of the U.S. Department of Health and Human Services. Their Toxicological Profiles, is particularly useful for when a pollutant can be identified by compound or element.